Hi, my name is Kristy and I'm a watermelon addict. I name them at the grocery store (usually W names - Wilson, Wilma, Wilamina, Wally), carefully carry them like a baby into our house and then.... Murder them. It's not pretty and I'm not sorry. Funny, you think I'm joking about the above but it's true... I'm totally a weirdo and totally obsessed with watermelon. In summer, I often pass up cooked vegetables for salads. 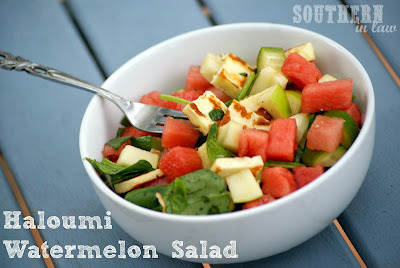 Watermelon salads are my absolute favourite, but I like to mix things up from the usual watermelon and feta mix. Usually my salads get called "kitchen sink salads" because I kind of throw a whole bunch of different things into the mix. 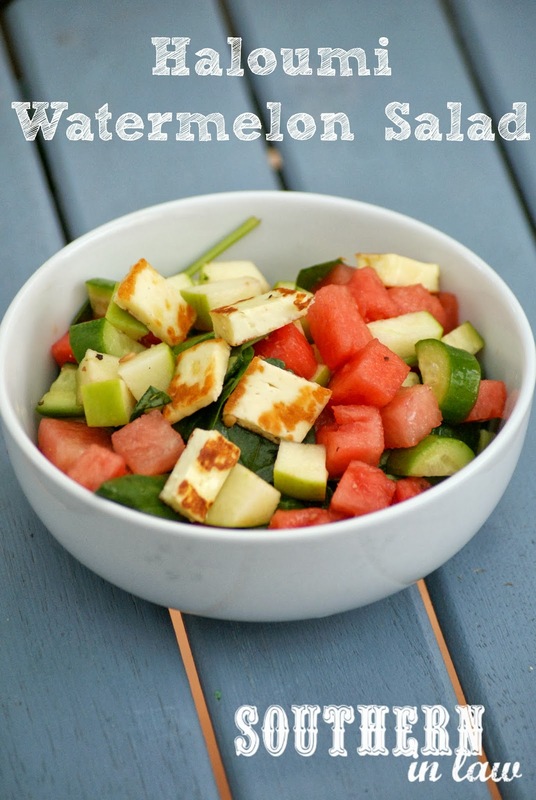 Haloumi isn't a usual partner for watermelon, but trust me! These two are a match made in heaven!! Pour into a serving dish (or eat straight from the mixing bowl as I usually do) and devour!! But tell me, what are your favourite salad additions? I love adding fruit to salads - watermelon, blueberries, apples, raisins, dates - and all of my salads have to have some sort of cheese or dairy too!